~Coming from Montana, this place is a start contrast to our mountains, hills, shades of brown and forests of green. One color characterizes Borneo: green. There are hints of brown and splashes of blue but the green swallows those up. It is so pronounced that descriptions elude me. It is, to say the least, quite unique and beautiful. ~After tree planting we ate dinner at the Kinabatangan Orangutan Conservation Center and split into two groups. My group trekked through the jungle and up a rock outcrop of limestone to visit the entrance of a swiftlet cave. 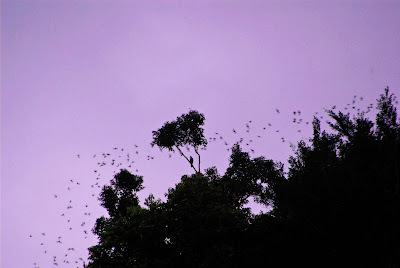 A swiftlet is very much like our “swifts” back home, they are bat version of birds. These swiftlest are special because they build a nest on the cave walls from their own spit! The nests are incredibly valuable and sell for thousands of dollars per kilogram, some to Malaysians but most to the Chinese. The nests are turned into Bird Nest Soup and consumed by only the wealthiest people. A swiftlet nest, worth several thousands of dollars per kilogram! The cave is protected by a small group of young local people who live on a small platform at the entrance to the cave. These people stay at the opening 24 hours a day, without any form of electricity, restroom or any amenities. They work 27 days per month, getting to go home for only 3 days at a time. I was astounded at their willingness to sacrifice so much of their life to protect the swiftlets from "robbers". When asked, they said the reason they continue to endure is that they love seeing the population of these small birds increase because of their protection. After a short boat ride back to Sukau we regrouped to travel to Gomantong Cave, one of the largest swiftlet caves in Borneo, possibly THE largest, I am not sure. I will have trouble putting the cave into words because it was something that tugged at all of my senses, but, I will give it a try. It took only a short trek on boardwalks through forest to arrive at a small compound of ramshackle buildings and just beyond them lie the massive black hole entrance inviting us to enter so we could be swallowed up. The smell of bat guano (poop) poured out of the cave, testing the will to enter. The inside was a sensory nightmare. Just enough light to see things moving, not enough to tell what was crawling around. Inside we saw swiftlets, bats, cockroaches, millipedes, and literal mountains of bat poop. I thought the mouth of the cave was big but was unprepared for the interior: just imagine you are standing in the lobby of the Empire State Building, then take away all that is inside the building so it is just a shell, allowing you to see all the way to the top; turn off the lights, then punch a big hole near the top to let in a small beam of light. Fill it with all of the creepy crawlies your nightmares can muster. Then, and only then, can you begin to understand the Gomantong Cave. Guard shack in the cave. With thousands of bats and millions of cockroaches, I cannot imagine having this job; sleeping in the middle of a blacked out cave with all the critters of the creepy world surrounding you. ~Incidentally most of the bird nests for Bird Nest Soup come from this one spot, still harvested by the locals swinging from ropes so long that they disappear at the top. Outside the cave we saw Red Leaf Monkeys, another first for me. We also saw millions of bats streaming out of the vent in the top of the cave, kites (hawks) picking them off for a quick dinner. Bats stream out of Gomantong Cave as a Kite (hawk) sits in its perch, waiting to grab a bat for dinner. I slept well, did laundry in the morning (washed the dirt off my clothes using a little bucket and some Dr. Bronner’s Peppermint soap). We use the same bucket as our shower. Drawing ladles of water out to pour over our head and the water drains down a hole in the floor and our of the house onto the ground below. If the clothes every dry I will have two sets of “clean” clothes to fill with sweat and mud. Earlier today we boated down river to look at Orangutan nests atop the tree canopy. We were greeted by a mother and her young daughter as they fed on leaves near their nest. Then off to see how they record data on tree nesting sites.